ZURICH (Reuters) - Switzerland's biggest bank, UBS, on Friday reported a nearly $400 million boost to its litigation provisions after a French court slapped it with a 4.5 billion euro ($5.09 billion) penalty last month. 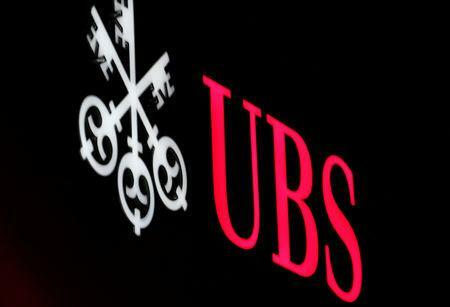 UBS, which is appealing against the decision and has said it expects an appeals court to "correct the mistakes" of the prior ruling, has now set aside a total 450 million euros ($516 million) to address the charges of illicitly soliciting cross-border clients and laundering the proceeds of tax fraud. "In light of the first judgment and considering the full range of potential final decisions, the provision on our balance sheet reflects our best estimate of possible financial implications," the group's chairman and CEO said in a joint letter to shareholders. "That said, we still believe the verdict should be reversed, at which time we would release the provision." The move to specify how much the bank has earmarked for one specific case is unusual, but shareholders and analysts have been eager for clarity on what UBS might now see as a likely outcome after penalties imposed by the lower court broke records for France and far overshot expectations. The appeals process is expected to take years, and could see the bank and prosecutors go through at least two more verdicts. While UBS did not specify by how much it had increased its provisions for France, group-wide litigation provisions rose to $2.83 billion from the $2.45 billion initially reported for end-2018. The added provisions pushed down 2018 net profit to $4.5 billion from the $4.9 billion reported in January. UBS had pushed back the release date of its annual report in order to assess the French court ruling's impact on its finances and determine whether it needed to bulk up litigation provisions.